So what’s going wrong? Nine times out of ten, it’s not your offering. It’s your story. Find out more by viewing our webinar and downloading a copy of our white paper. 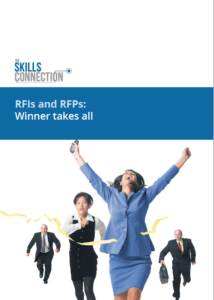 When it comes to RFIs and RFPs, there are five main reasons why well-qualified companies get it all wrong. Find out more in our white paper. To receive your free copy, please fill out the form on the right. The traditional approach to RFI/RFPs typically suffers from information overload, incoherence, inefficiency, poor quality and… submissions that, for the reader, are as dull as ditch water. It is resource-intensive, and all too often leads to you committing time and money to simply have the frustration of losing. During this webinar you will learn how to transform your RFI/RFP methodology by following the practices that we have seen deliver real success for customers. You’ll find it’s more efficient, and it truly will enable you to increase your conversion rate. We can help you get that story right, contact us now.